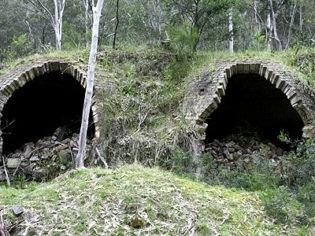 Decrepit coke ovens lie hidden in the valley. Australia is blessed with some accessible, totally underrated and hidden beautiful campsites. Newnes, on the other western side of the Blue Mountains, has to rate among the best. AT’s Quentin Long reports. Like any good campsite, the best way to reach Newnes is debatable. You can bounce in along the 4WD track off the Bells Line of Road. Or you can drive into Lithgow, head towards Mudgee, turn left at Lidsdale and past the colliery and up the Wolgan Valley Rd. Off road is always far more interesting. Hyundai wanted someone to give their new “soft off-roader”, the 2009 Santa Fe, a bit of a kicking and I obliged. Ducking off the serene and leisurely Old Bells Line of Road at the Zig Zag railway, the car was to be tested along the track down the mountains. The potholes could fit a mini, the road was lost to craggy rocks in several places and it was raining. At the wheel, the sensation of smashing through a crater as the water cascades over the roof is unbeatable, particularly as any damage was neither my fault nor responsibility. The car stood up to the beating I meted out, didn’t miss a hole, puddle or rocky crevice. It’s a comfy ride; the engine has all the requisite power. It’s a bloke thing – but I would have preferred a manual. The Hyundai people are at pains to put the “cheap and cheerful” tag behind them with serious performance and reliability from their modern fleet at a great price. The gains they’ve made are great and their image is going to catch up in the coming half decade. As an example of this work, the Australian model of the Santa Fe has a unique suspension system designed here in Australia for our Australian conditions – which, by the way, are the roughest on and off tar. For serious off-roaders, the Santa Fe will probably never beat the larger vehicles like the Patrol and Land Cruiser that turn into urban assault vehicles in the city. But for both city and off-road driving – the soft off-roader in the industry language – it is an attractive option. Halfway down the track, spectacular rock formations rise like rocky Ents from Tolkien books to the treetops. At last I can use the word “enchanting” with real meaning. A still, walled-valley with hidden caves, coloured rock walls and fern glens, it is enchanting – you can imagine Possum Magic happens in a place like this. It’s just a pity “Shane” beat us to the cave to scrawl his name in two-foot high charcoal. Hooking up the 2009 Santa Fe to pull him out, Oscar’s humiliation is complete; the diminutive Heidi (five foot on a hot day) expertly hooks him up to the snap straps to drag the sodden car out. Right at the end of the Wolgan Valley as the two sandstone walls start to converge stands the solitary Newnes Kiosk – formerly the Newnes Hotel – truly a pub without beer. 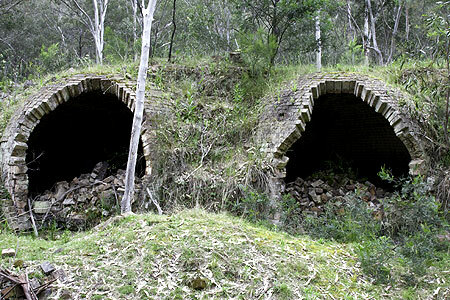 Newnes was a thriving metropolis before the oil shale mine was abandoned. Today it’s population two, if you’re lucky. Slightly dilapidated, a real estate agent would describe it as bursting with old-world charm. It’s one of those buildings that could be quaint and romantic in a film with Hugh Jackman, Tom Williams and Sigrid Thornton. Or it could be the sinister stop over point in the sequel to Wolf Creek – Wolgan River. The campsite across the river (4WD only) is as picturesque as you could hope for. A flat glen of soft grass infested with wombats and birds, the setting is – and at last I can use the word with meaning – magical. The steep walls peer down protectively, the bird noises overtake the chatter of humans but the real charmer is a possum. At the campfire, a possum with an oversized and clingy teenager waddles into camp to help herself to scraps and unprotected food. Possum magic. Waking up in the protective embrace of those gentle sandstone cliffs is a moment of happy appreciation of our good fortune to be born in this lucky country. Newnes camping is on a first come first serve basis, no fees or booking required. The Shale Oil relics are spectacular, try and get the whole story at the kiosk. Wolgan Valley entertains the world’s wealthiest people at The Emirates Wolgan Valley Resort. The Wolgan Valley road into Newnes is dangerous. If the trucks enroute to Lithgow or Emirates don’t frighten you, the numerous wombats and wildlife might. It’s dangerous, so drive with caution and try and avoid dusk or dawn.